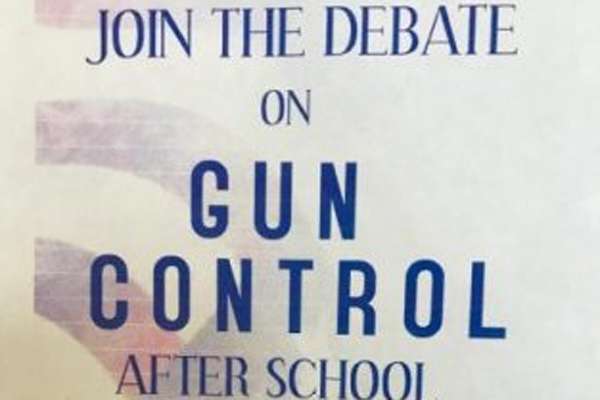 DHS' Model Congress hung posters promoting an after school conversation about how students feel about gun control. What is Actually Going on in the Gun Control Debate? The tragedy of the Marjory Stoneman Douglas High School in Parkland, Florida mass shooting on this year’s valentine’s Day has taken the nation by storm – in both good and bad ways. People all across America have been protesting and pleading for a change in our gun laws and many politicians have replied. Above all of it, though, it’s the students with the voices that speak the loudest. As high school students in Connecticut, this is a subject that hits close to home for us. Through all of the hectic mayhem, it’s hard to understand what is actually happening. Let’s take a look at what is currently happening among our government workers. The Parkland shooting is known to officially be one of the deadliest school shootings in American history. It left seventeen people dead and a number of others injured. Through all of the horror, though, what’s most surprising is that it is the students that are spreading the nation wide movement of changing ourgun laws. 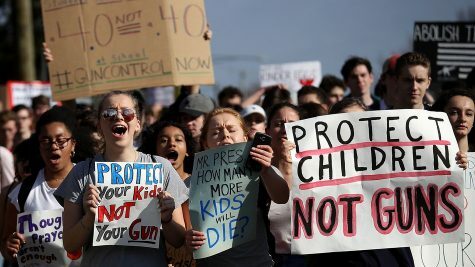 Teenagers from Florida and other parts of America have decided that enough was enough. By putting lawmakers on the spot, new conversations have been widely circulating. After so many deadly shootings without much action from Congress, it’s hard to determine where our laws are going to go. Ideas that were once deemed unfathomable, such as background checks and raising the age limit, are finally being considered by Republicans. One other suggestion that began to spark within the White House was arming teachers in schools themselves. At the moment, it seems that promises President Trump has been making are ones that he is avoiding. Recently, President Trump has posted on Twitter that the increase of age for purchasing a gun is in the hands of states and that some members of Congress won’t back the change. “On 18 to 21 Age Limits, watching court cases and rulings before acting. States are making this decision. Things are moving rapidly on this, but not much political support,” Trump tweeted. The hope of some advocates for the age increase began to crash after realizing that the new law would come in a “package of measures” with being able to strengthen school security would not be able to apply all school in the U.S. Instead, Trump is calling to create “red flag” laws. These laws allow authorities to take away and individual’s gun after a court determines that the individual is capable of harming themselves or others. Laws like these fit into the “package of measures” that will supposedly discontinue a string of school shootings and make security within schools stronger. However, Trump has once again backed out of his promises and changed his mind. At the moment, “red flag” laws are a no-go. As for the subject of adding guns to schools, Trump is indeed in favor of having school staffs being armed which is also in line with the NRA policy. Of course, the NRA saying goes: “The best way to stop a bad guy with a gun is a good guy with a gun.” Most teachers or other staff members are opposed because they don’t believe that bringing more guns into school is a good idea. In response, lawmakers propose that teachers are trained to operate guns properly. The job of a staff member being armed is however voluntary. Another negative aspect is that this move will be taking huge chunks out of school budgets. On a brighter note, new measures considering gun laws have been passed and signed by Republican governor, Rick Scott, in Florida. It was the first change in gun laws in more than two decades. Increasing the minimum age of being able to legally buy a gun to 21 is one of the main laws passed. Florida has also banned bump stocks, an attachment put onto a rifle that causes it to fire more quickly. In addition, they are also advocating school staff members to be armed voluntarily, however, a volunteering member would need 130 hours of training. Still, one of the most surprising facts is that it was in fact a Republican state and a Republican governor that passed all of these laws. Sadly, the NRA has just announced that they are suing the state of Florida for violating the second amendment of the Constitution.